One of the most important things to do when you are planning to change your watch band is to measure the existing band (if possible) and find out the width and length. Without those two measurements, you will not be able to ensure that you have the right size watch band for your watch case. Use this guide from Esslinger.com to help you successfully measure a leather watch band. 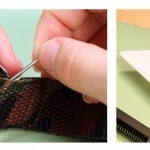 You can use this same method to measure silicone, nylon, and diver Velcro watch bands. Always be sure that you are ordering the right size watch band. Before you can measure the watch band, you must first remove the old band from the watch case. You can learn How to Remove a Leather Watch Band here. Once the old watch band has been removed, the first thing to do is determine the width of the watch band. Remove the spring bar from the band and prepare to measure the flat end that usually holds the spring bar. You can do this in two different ways. Take the flat end up of the watch band and line it up against your ruler so that one edge is even with the zero marker on the metric side of your ruler. Note where the other edge of the watch band ends and take that measurement in millimeters. Note: you can also make this measurement with a digital gauge. Hold the watch case in your hand so that the lugs are facing outward. Then take your digital gauge and place the backward opening upper jaws in between the watch case lugs. 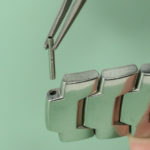 Open the gauge’s jaws until they fit snugly against the inside of the watch lugs. Record the millimeter measurement listed on the gauge’s display. If the measurement is not a whole number, round up if the decimal is five or above, and round down if the decimal is less than five. 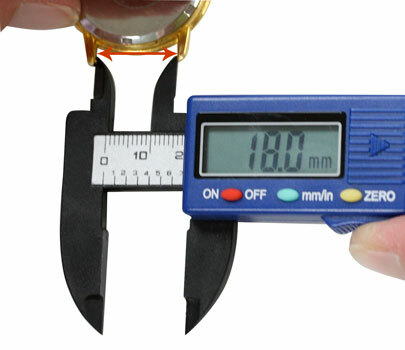 Note: while you can take this measurement with a ruler, you will get the most accurate results using a digital gauge. Now that you know how wide the watch band is, you can measure for the length of the watch band. Start by lining up the two flat ends of the watch band parts so they are touching – remember to keep the watch band parts arranged so you know which side belongs where on the watch case. Next, take your ruler and align the zero mark on the standard side of the ruler with the end of the watch band that holds the clasp. DO NOT include the clasp in your measurement. When you’ve aligned the watch band with the ruler, read the measurement where the pointed end of the watch band stops. This is the length of your watch band in inches. 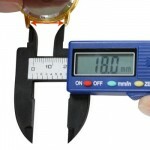 Once you have the length measurement, you can easily order a replacement band that is the perfect size for your watch. If you need help changing your watch band or placing the new watch band on you watch case, check out this article. You can shop here for replacement bands. The width and length are listed for each band. i am still waitinjg on how to get my watch band. You can shop our selection of watch bands at Esslinger.com, here is the link to the watch bands category. You can shop by length, color, width size or style to find the right band for you. Ostrich …do you have one on hand? But if you’re looking for a genuine replacement please use the watch parts inquiry form for help finding the band you need. The parts department will research your request and get back to you in 2-3 business days with a cost and availability. I have several silicone bands for my Garmin 235 Forerunner. the silicone is irritating my skin more and more now. Im looking for a 15mm X 75/8 or so band in leather. I like what you have in croc and lizard but generally cant find the length I need. I could go a little shorter but 15mm is the exact for width. On the band I have, there are cut outs on either side so the band is actually wider than the distance between the lugs. Can you help me? i dont want black. Gray, blue, green, natural browns are all viable options. Thank you!!! Since you say the band is actually wider but notched down to 15mm you can buy a 16mm and use an exacto knife or band notching pliers to cut it down the correct width. I hope you can find a band to your liking! i have a Hamlin ultra thin men’s watch with a black mesh strap held by screws 16 mm apart. do you have a black leather strap that will fit? We do not have any bands that are screwed into the watch that fit 16mm width. We an supply a standard leather band with a width of 16mm that you might be able to modify to work for you.